Singapore's rat problem is showing no signs of letting up. About 6,700 complaints were received by the National Environment Agency (NEA) last year, up from around 4,000 in 2014. 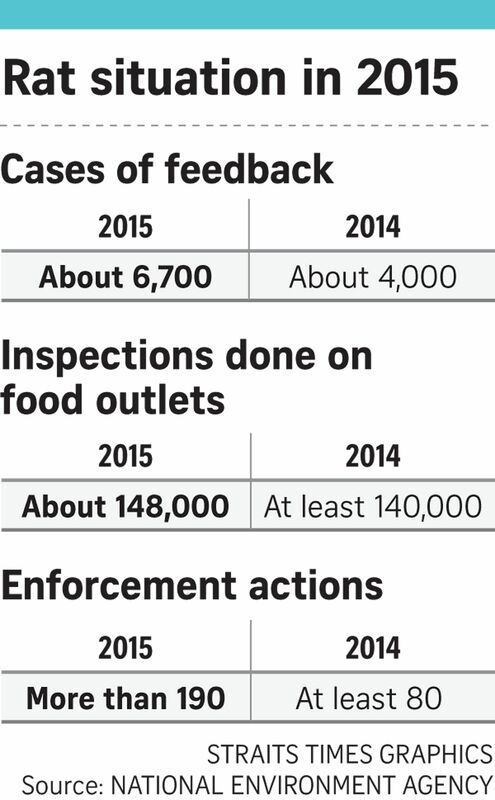 The number of food outlet inspections also rose from around 140,000 in 2014 to about 148,000 last year, while enforcement actions were taken against over 190 owners, up from 80. The NEA, which revealed the figures this week, plans to boost efforts to treat detected rat burrows, including those that fall under the responsibility of other agencies. Other measures are also being considered, though no details have been given. The public has been growing increasingly concerned about the rodent problem since a rat infestation near Bukit Batok MRT station in December 2014 and the discovery of a dead rat in a vegetable dish at a Chinese restaurant in Marina Square just over a year ago. Star Control Pest saw its rat-control work increase by 25 per cent last year. Its general manager Bernard Chan, 46, told The Straits Times: "In the past, when people and businesses talked about rats, they showed less concern. "The Bukit Batok incident drew a lot of attention. Our customers are now showing more concern, especially after that Bukit Batok incident and the one at Marina Square." The NEA said about 85 per cent of rat burrows were found in housing estates with the rest in areas such as private land, buildings and food shops. The authority said that it provides advice and support to town councils on rat control measures. As part of its revised Rat Attack programme, the agency gave funding to town councils where the focus was shifted from treating rodent burrows to culling rodents in bin centres and bin chutes which provide their food sources. The Straits Times understands only two town councils have not opted into the revised programme - Marine Parade Town Council (MPTC) and Jurong-Clementi Town Council. Acting public relations manager for MPTC Tan You Yi said its current pest control contract, which started in January 2014, will finish at the end of this year. She added that it opted out of the revised programme because "the funding requirements were different from the contract specifications spelt out in our contract". Jurong-Clementi Town Council said it has customised its own Rat Attack programme. Measures include weekly inspections of bin centres, markets, hawker centres and food establishments, as well as fortnightly inspections of other common areas.